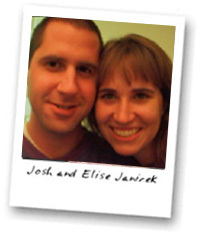 This is Josh & Elise Janicek’s personal weblog. Janicek is pronounced Yawn-uh-check. Josh is of Czech descent. He provides 99.72% of the content. He uses this website so he can document the lives of himself, Elise, and their two daughters, Maly & Mara. Josh was born on January 26th, 1976. Elise was born 11 months and two weeks earlier than him. Josh was born and raised in Houston and spent his junior high and high school years in Cat Spring. Elise was born in Lincoln, NE and spent her formative and young adult years in Des Moines, IA. Josh moved to Austin to pass through the ivory towers of the university in 1994. Elise did the same, after a few years of college in Des Moines, in 1996. They first met in the photo lab at St. Edward’s University. Elise is a pre-school teacher, professional photographer and Stay At Home Mom. She has a B.A. in Photocommunications. Follow Elise on Facebook. Josh runs two successful software companies. He loves running. He is also responsible for the bend in rainbows and the reason why milk sometimes shoots out of your nose when you laugh. He has a B.A. in Communications & Media Production. Follow Josh on Facebook. Josh and Elise live in Austin, TX with their daughters, Maly and Mara. You can see our online photo gallery here. Josh wrote this in the third person because the shareholders told him to do so. This is good stuff. Thank you for sharing — keep it up Janiceks! I am writing because we may be kin. My g-g-grandmother was Rosalie Janicek and my g-g-grandfather was John Janicek . They immigrated from Novy Hrozincov, Moravia in 1872. My ggma only lived about 1 1/2 years and died. Her gravestone only shows Rosalie Janitschek. And has no maiden name listed anywhere. Just in case you happen to be the lucky connection I am searching for,,, perhaps you can give me her maiden name. I am 84 years of age and have been at this since 1989. I would be sooo happy to get this 1 last bit of info. Does it sound even a little bit familiar. My gma’s Name was Veronica, she was called Veruna, and she had brothers John , Frank and 2 step-sisters. After ggma died, ggpa married a lady with er last name of Barosh that had come over on the boat with them. So what do you think of all of this? Please let me know, or maybe give me a little nudge where I can get some other help. Thanks, Georgia.You have a lovely photo. Hi Josh & Elise. I chanced upon your blog and found it an interesting family read not only for being written by a namesake. Interesting! I am. janicek in Minnesota. Grandparents were Elizabeth Cadra and Stephen Janicek/ Brataslava. Have only once come across this spelling when I have come upon other “Janiceks”.